Have you ever really made a mess? Like the time I tried a new “short cut” Bundt cake recipe which sounded like the cake I had enjoyed the previous week. It bubbled over and out of my pan like an erupting volcano, and I ended up with a mountain of scorched batter in the bottom of the oven. Or like the way I can make a real “mess” out of trying to express my feelings to someone who really doesn’t want to understand (teenagers come to mind). I just dig the hole deeper and deeper and sometimes begin to doubt that even I understand what I am trying to say. Or like the way I can over-commit to various obligations and get overwhelmed by my list of to-do’s? After Cindy cleaned up the mess and assessed the destruction, Princess lay on her lap, belly up, a mass of fluffy black dog, completely trusting that nothing bad was going to happen to her. Pictures don’t do her justice. She turns into a black fuzzball whose features–floppy ears like silk and one opaque eye (blind at birth)–just blend together. But, she is at rest with no fear and no regret. I wish my messes were so easy to overcome. Yes, the oven came clean. So what if I had to throw out the cake that wasn’t? I hope my family and friends forgive when I have failed to convey my thoughts and feelings in anything resembling articulate speech. And, although I may whine a bit and feel sorry for myself, I meet my commitments. I just wish I could relax like she does, trusting that no harm will come of my messes and that I will be accepted just as I am. I wish I didn’t ruminate over the misspoken words or the perceived hurt. I wish I didn’t regret mistakes so much. I wish that I weren’t such a perfectionist. Anybody else belong to that club? “Perfectionists Anonymous”? There should be a support group. At least age offers some respite, as I find that the more years I get behind me the less I worry whether there is a little dust on the table. If only my expectations of myself were so easy to manage! Because there’s a little voice in my mind reminding me of the unfinished manuscript that keeps calling my name. The basket of clothes to iron won out today. That voice had been nagging longer and louder. So the ironing is done and I’ve opened myself up to you. And, that’s ok for today. Hoping your tomorrow is a good one and free of “messes”! This is the way my morning begins–on good days. The Bible is only 21 years old this year but the leather cover is frayed from being carried in a “Bible cover” for many years. Virtually every page in it is highlighted and marked with sermon notes in the margins. It is well-worn. Kind of like me. Having reached that point in life where one reviews where one has been, the things one has done, the accomplishments achieved, I have found myself struggling over the past few months. Have you ever felt that there was something that you were absolutely meant to do through some divine plan but found apparent roadblocks at every turn? That’s me! My first calling to a profession came when, through a series of unusual events, I ended up in a baccalaureate nursing program. I graduated in 1978 and have spent the past 40 years working in the profession in one role or another. 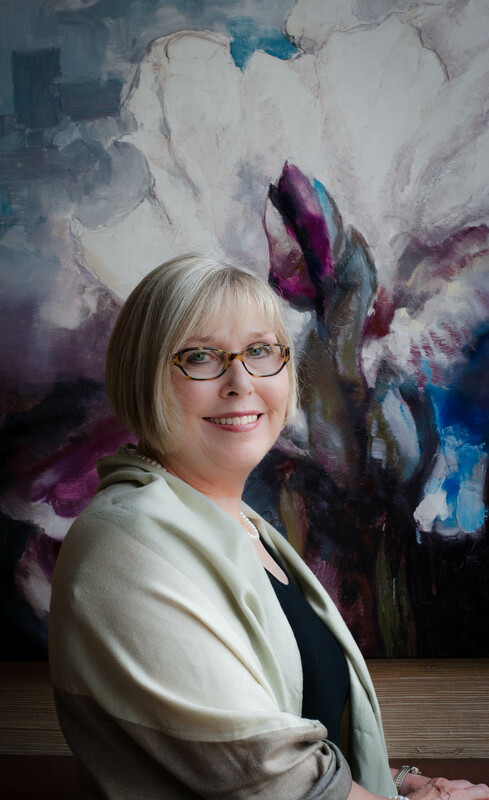 There were some times of turmoil and transition as I found my way to my current role as a nurse practitioner. I stepped into that role 21 years ago and have never regretted the move. Throughout it all, nursing has been very good to me. And I’m not quite ready to give it up, yet! But hidden in my heart was the dream of being an author. I’ll confess, early on I was just thinking that I could write a romance novel as good as, if not better, than many I read. But somehow I just couldn’t bring myself to put that steamy stuff on paper with my name attached! Then the amorphous dream congealed into a path that truly felt like a calling. That’s the road my journey has taken me down now. But it’s a road filled with roadblocks and potholes and breakdowns. My goal as a writer? To portray the truth that God pursues us in the ultimate love story, our journey through the triumphs and tragedies of life, wooing us back into a walk with Him whenever we lose our way. Sometimes when times are really good, I forget to acknowledge that all good things come from Him, not just from my efforts. And, sometimes, when terrible pain or loss occurs, the mental and physical and spiritual exhaustion has left me floundering, trying to regain my footing on the solid foundation of faith that this life requires. For some reason, God has given me stories in my head and heart. Stories that speak to the real problems that everyday people experience. Stories that speak to the only real solution to those problems, a return to faith. But the struggle to be traditionally published, to market the work already done, and to have the resources to continue this journey often gets me down. A couple of the devotions I read during my early morning quiet times recently spoke to me in a special way. One spoke to the issue of being a “recovering” perfectionist. I qualify. So often I am stalled by the search for perfection, when I just need to be writing and doing. I’m working on that. My house is not as clean as I kept it 20 years ago. I can say “no” when asked to do something that I just don’t have time for. I don’t struggle with my appearance like I did when I was younger. The other was titled “The Day I Stopped Believing.” It spoke of a time that the author had experienced terrible life struggles and began feeling that, although God answered prayer for other people, He just didn’t hear or heed hers. I haven’t stopped believing in prayer or in good things happening. But the patience to wait for God’s timing is wearing thin. My dad told me many times that I needed to “learn patience.” I’m not there, yet, Daddy. I love the woods behind our home. There is so much history here. My husband and his siblings were born and raised on this land, and they all tell stories of playing in these woods. My grandson has grown up here and has learned some survival skills as he’s camped with his friends. This place is part of me. I’ve been pondering how to explain my journey as a writer. I feel myself changing and the longing to write becomes stronger every day. With the early posts on this blog and the first book I published, I think my purpose was clouded with the mist and fog of lack of clear vision, like the picture above. My words may have entertained and offered insight into faith and some social issues without any realization of my true purpose in writing. And then my journey, my development, was distorted by distractions and intrusive thoughts of fear of failure and inadequacy in managing the constellation of things required of successful writers. Sometimes these feelings and struggles are still overwhelming. I am struggling to overcome them. This past fall I experienced somewhat of epiphany, a serendipidous moment when my vision cleared. I started work on a book, not the typical Four Corners format, and, as I was pitching it to an agent at the ACFW (American Christian Fiction Writers) conference in September, I suddenly knew the kind of stories that I want to be writing and publishing and known for. They are, indeed, inspirational and contemporary and romances. But the basic vision for this endeavor, a mission statement, if you will, came to me. I want to tell stories that make clear the greatest love story of all, the ultimate romance, the Christian faith. That romance is God reaching out to man with love and grace and mercy and wooing us into a true, loving, faith relationship with Him. And, as we experience the mountaintops and valleys of the Christian walk, sometimes we drift away or even turn away from God. Sometimes we become angry when tragedies come out way. We often wonder why and question God. Yet , through it all, in spite of all, He faithfully woos us back. You see–that is the greatest love story, the ultimate romance. I have a new peace about my writing efforts. Whether I experience worldly success or not, if I write stories that picture God’s love relationship with man and even one person is touched by each story, I will be fulfilling what God has called me to do. Because I do believe writing is just as much a calling as nursing has been. He opens different doors thoughout our lives. I pray for strength and inspiration to continue this journey. And, to each of you who read this through, thank you for letting me share my journey with you. Words set free. . . True north. . . . In the past I have found it a challenge to stay on course with the writing. There are so many things that distract me. People that I love, situations that I worry about, housework to be done, a love of cooking, my fulltime job–I could go on. I think of Steffie’s comments when Daniel was circling the drain in his depression and addiction. “He’s just so lost, Mom,” she said all too often. We all tried to pull him back on course, with prayers and, when he would listen, words, but he had lost sight of his true north. The true north that I am talking about is not a constellation or a point on a compass. It is keeping one’s heart and mind focused on Jesus Christ. “Abide in me,” Jesus said. How faithfully am I abiding in Christ? How faithfully are you? I know that failing to abide in the Lord is the path to ruin. I know that losing sight of our spiritual North Star is a dangerous thing, leaving us open to negative thoughts and bad decisions and Satan’s attacks. Since I recommitted my life as a writer to Jesus’ cause, the words have come easier, more freely, and more purposefully. So far, the magnetic pull of my true north remains strong. Each and every time I press the keys of this keyboard and watch the words appear on the screen, my heart is full of hope that someone out there needs those words, those thoughts, in order to experience a refill of hope, peace, comfort, and strength to persevere in the walk of faith. Please know that each time I press “publish” for a post, I am wondering if it’s good enough, real enough, true enough to touch someone’s heart. Thank you for letting me share my journey with you. “Freely Given”, a year later. . . . It came to my attention (courtesy of Facebook) that one year ago yesterday, July 13, 2014, to be exact, a photo was posted on that social media site. 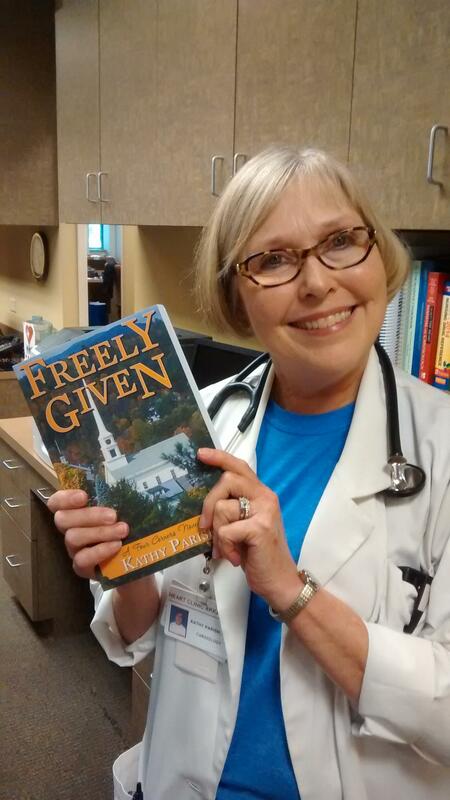 It was a quickly snapped photo of me, while at work on my “real job” as a nurse practitioner, holding the final proof copy of Freely Given, my first novel, self-published with the help of Create Space. It is not my favorite photo of myself–a bad hair day–but it does record a momentous occasion. Because I became, with that event, officially a published author. Unfortunately, I am more of a writer than a publicist or promoter, and I cannot describe stellar sales for the book. However, I am gratified by the number of people who have shared their unsolicited opinions, verbally or written, that they enjoyed the book and that it was thought provoking. I do now understand the issue with “platform” as being critical to success as an author. Understanding does not lead to mastery. Understanding does not sell books. And, understanding does not get me off the hook. I have to keep working at it. What will free me from anonymity? Any constructive advice is welcome! However, those who have read Freely Given are often asking me about the next book in the series, which is titled Colorado’s Choice. The character Colorado is one of my favorites from the first novel, perhaps because he reminds me of my dear husband, who has strong “cowboy” roots. As a teen Donnie “broke” horses to ride in order to earn spending money. He did a bit of bull riding in local rodeos. In one phase of his life he trained bird dogs professionally, and he once owned and showed a National Champion in the National Bird Hunters Association field trial system. The dog was a pointer named Persimmon Ridge Jake. Donnie has an extraordinary mind, understanding the intricacies of plumbing and electrical construction work, and has been licensed with both Master Plumber and Master Electrician licenses. He designed and built our home after researching “concrete form construction” in order to protect us from the tornadoes that so frequently strike in Arkansas. He also researched and constructed the ultimate “safe room” in our home. He is a strong, kind, opinionated, loving, and gentle man who will do whatever it takes to help someone in need, who has numerous male friends who often seek his advice, and who is my best friend. Many of you have asked about the next story. Just let me say that there is a new woman in town, a woman with a past, a woman in need. A dark side to Four Corners comes to light (no pun intended). Colorado has a secret. Charlotte is struggling to find her way as the single sister of the happily married Preacher Chad. She, too, has a secret, and has developed a propensity to get herself in tight situations. And then, there is the ongoing challenge of opening a domestic abuse shelter right in the middle of Four Corners, where everybody knows everybody else. How will it all end? We shall see. . . . . . . . . . I, too, can have a secret!